Third in a series on Harvard’s deepening connections to Mexico. MEXICO CITY — Three times larger than Texas, Mexico is home to 120 million people. Just over 1,200 of them are Harvard graduates, and yet many of these alumni wield outsized power and influence. 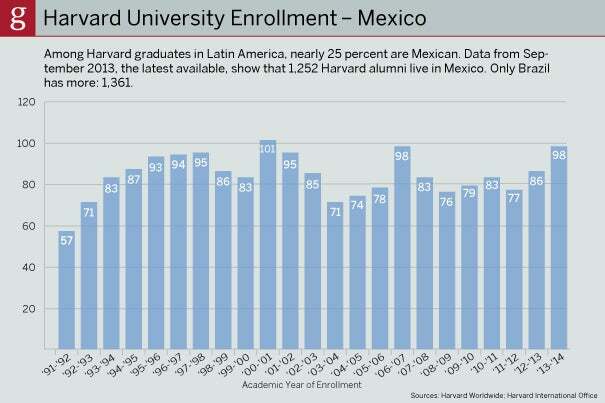 Harvard graduates in Mexico move within networking corridors that are extensive and busy. They populate alumni clubs in every Mexican city, keep in touch with old schoolmates, and look for each other at business gatherings. “Every meeting I have, I see someone high up in the chain (who) went to Harvard,” said physician and public health care entrepreneur Santiago Ocejo, M.P.H. ’10, M.B.A. ’14. “Harvard graduates are connecting,” agreed Sergio Cárdenas, Ed.D. ’09, of Mexico City, a professor of public administration at CIDE (Centro de Investigacion Y Docenia Economicas, A.C.) who is part of a lively web of former students at the Harvard Graduate School of Education (HGSE). His four years there provided him with social science tools and other knowledge, he said, but also a “larger network of very talented people” to help with major projects. That network extends into high places, where a recent graduate said “a small Harvard” is making a difference. Of Mexico’s last six presidents, three were Harvard graduates. Another graduate is the CEO of Pemex, the country’s signature oil company. One is a deputy minister of energy. Others run or help run the federal and state ministries of health, environment, finance, law enforcement, and social security. The chief adviser to Mexico’s Ministry of the Interior is a Harvard graduate, as is Mexico City’s development minister. The official who tracks education progress in Mexico (and elsewhere) is a Harvard graduate. Ana Eugenia Garduno, Ed.M. ’11, a doctoral candidate who once worked with Cárdenas on an online project for teaching the scientific method, is director of education for Latin America at OECD Mexico, part of the Organization of Economic Cooperation and Development, a 34-nation policy and statistics platform. Young Harvard graduates return to Mexico because it is home, and because they can rise quickly in their professions and have nation-building influence early. “I wanted to make a dent,” said Mexico City architect and designer Jose Castillo. Arquitectura 911sc, the firm he runs with his wife, Saidee Springall, M.Arch. II ’96, is overseeing its fourth cleverly designed affordable-housing complex. Early, the firm created the master plan for the BRT (Metrobús), including its network of self-contained stations. The growing bus network has the potential to revolutionize the commuter culture of the capital. That culture — 5 million trips in and out of the city center each day — is still dominated by microbuses, the colorful but unregulated conveyances that account for 60 percent of commuter traffic. Privately owned, they grind, tilt, speed, and puff exhaust through the day and night (when their headlights are seldom switched on). Emanuel Garza, Ed.M. ’05, moved back to Mexico and founded a university. Classes at Universidad Carolina in Saltillo, near Monterrey, began this September, with about 30 part-time teachers and 300 students paying the equivalent of $200 a month for tuition (or $100 for those in the high school track). “This is really because of a very clear need,” said Garza. It’s a low-cost, accredited alternative for bright students who are shut out of admittance to public universities (where space is limited) and to fine private universities (where tuition can cost a forbidding $8,000 per semester). The new university not only fills an academic gap, it gives young people an alternative to the temptations of the drug trade. “It’s a lawful, meaningful, productive option for their lives,” he said. Vázquez, a cultural historian, is planning a sort of university in the streets for Mexico City. His nonprofit initiative Harvard en el Zócalo, “Harvard in the Marketplace,” has more than 100 alumni volunteers already and will get its start with a pilot project in February. A series of open-air lectures and roundtables will be offered every Saturday, featuring Harvard graduates, and spread out over two semester-like intervals a year. “The idea is to take Harvard to the streets — take high culture to the streets,” he said. The program is designed to be self-sufficient and sponsor-free, an educational template that eventually could be exported to other Mexican cities and other countries. After Harvard, Vázquez taught for three years at New York University. “I wanted to do something more — more real,” he said of his move back to Mexico to work on multiple projects for long hours. “If you’re Mexican, you have to get your hands a little dirty,” he said. 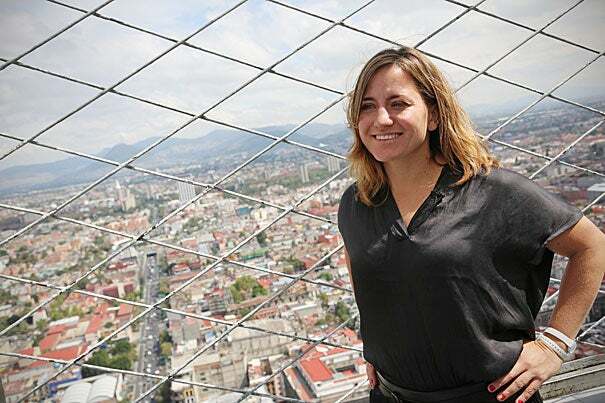 El Zócalo, a vast plaza at the political and historical heart of Mexico, is where Mariana Franco, M.Ed. ’10, is working on Digital Native, a pilot media platform designed to teach high school students how to create code. “It’s important for them to start,” said Franco, who co-founded Teach for Mexico in 2011, in part to dispel gender stereotypes hovering over the field of digital creativity. She has an on-site partner for the project, which is being tested this month in Puebla, southeast of Mexico City. On that issue, she took part in a Mexico City panel of alumnae earlier this month, sponsored by Fundación México en Harvard, A.C., a source of funding and guidance for Mexicans accepted to Harvard graduate and postdoctoral programs. Standing on the fifth-story green roof at Infonavit, with vistas of the vibrant city at her feet, Campos was wistful about faraway Cambridge. She described her time at Harvard as the “sweetest” in her life, and as a lasting font of good friends. A large cohort of Harvard graduates in Mexico works in the public health sector, busy confronting the challenges of a nation where chronic Western illnesses like type 2 diabetes and childhood obesity are taking hold, while traditional healthy diets are slipping out of favor. Among that cohort is Mexican physician Martin Lajous, who has a master’s (2004) and a doctoral degree in epidemiology (2011) from the Harvard T.H. Chan School of Public Health (HSPH). In 2006, he and a few colleagues — HSPH graduates Ruy López Ridaura, D.Sci., and Andrés Catzin, M.P.H. ’07, among others — started a long-term study of diet and health now housed at Mexico’s National Institute of Public Health. It was modeled on Harvard’s celebrated Nurses’ Health Study and uses a responsive and educated cohort of 115,000 Mexican teachers. “The knowledge base is already strong and deep,” said Lajous of the article-making study, and it has already had “rhetorical impact” in Mexico, where policymakers favor data derived from Mexico itself. Meanwhile, two young graduates of the Harvard Kennedy School, Jose Luis Romo, M.P.P. ’08, and Sandra Gonzalez, M.P.P. ’10, are high up in planning the Mexico City International Airport Project. It is among the three largest airport projects in the world, said Romo, with an ultimate capacity of 120 million passengers a year. At a cost of $14.8 billion, it also represents the largest capital budget undertaking in Mexican history. A compulsion toward public service and good works seems to thread through Harvard graduates in Mexico, from Castillo’s affordable housing and transit stations to Garza’s university for the poor to the social underpinnings that Romo and Gonzalez are adding to the built environment. Part of the reason may be that some of those Harvard graduates came from humble beginnings themselves, or at least observed disparities they now see as fixable. Viridiana Rios, Ph.D. ’13, who also grew up in a working-class neighborhood, was admitted to the doctoral program in government in 2007. “It seemed to me the path forward [meant] going to Harvard,” she said. Rios wrote her dissertation on organized crime, a process that paired her with journalists (and danger) in the border country and with a Harvard Kennedy School graduate who devised a Google News algorithm to track cartel activity. As Massachusetts faces a decision about casino gambling in an upcoming election, Frank Fahrenkopf, the former president and CEO of the American Gaming Association and current IOP fellow, offers insight on the state of the gambling industry, including a look at Question 3 on the Massachusetts' ballot.